Welcome to The Boat House, a delightful and quirky three-bedroom house. 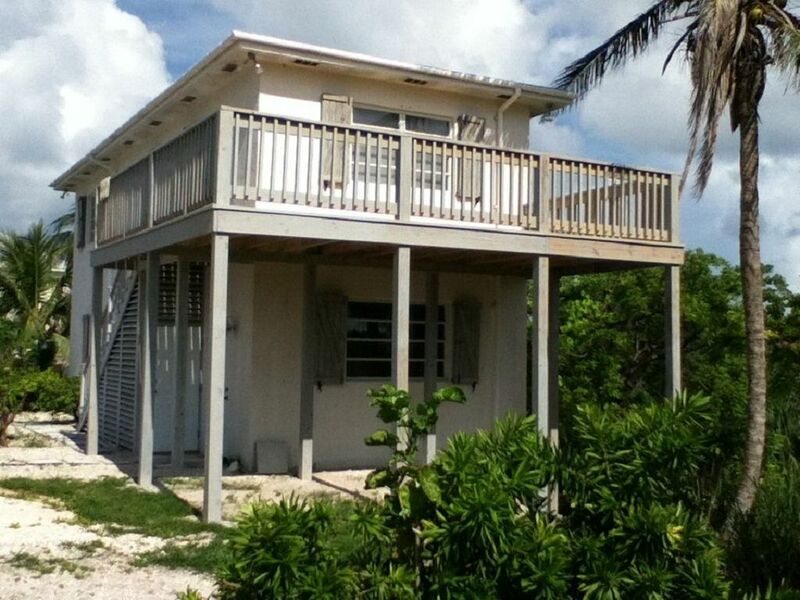 The Boat House is located on the Banks Road, the premier location on Eleuthera, just one mile from the town of Governors Harbour. It is 50 yards from world-famous French Leave Beach, a pristine beach renowned for its pink sand and turquoise water. French Leave Beach is over a mile long, with only five houses on the entire length. Guests of The Boat House may rent just the upstairs, which is a spacious and complete one-bedroom apartment, or the entire house, which includes two more bedrooms and bathrooms downstairs. Boat House is rented to ONLY one group at a time. Unused bedrooms are locked off. The upstairs of the Boat House contains the living room, dining area, kitchen, and one queen bedroom. It has beautiful views of French Leave Beach and the Atlantic Ocean from every room. The large sundeck has expansive ocean views as well as views of the pond behind. The upstairs also has a full bath and a laundry closet with washer and dryer. The downstairs contains a second queen bedroom and the Bunk Room, which sleeps 8 in three bunk beds and two trundle beds. Both downstairs bedrooms have full en-suite bathrooms. Each downstairs bedroom can be locked off if it’s not needed. The downstairs bedrooms are accessed from their own first-floor entrance; they are not connected internally to the upstairs apartment. Amenities at the Boat House include air conditioning, WIFI, satellite TV. and an outdoor gas grill. The Boat House now has a new full size refrigerator. Our housekeeper, Doreene, will come by once during the week to clean the house for you. If you would like her to clean more often, or to cook for you, she will be happy to do that for a modest charge. Cross a small road and walk down a short sand path and you are on French Leave Beach, an idyllic, mile-long, crescent-shaped beach rated one of the best in the world by USA Today. There are only five houses on the entire length of this spectacular beach. The surf is very mild, protected by a large reef system that parallels the shore. The water on French Leave Beach is literally crystal clear: with no rivers or streams on the island, Eleuthera’s seas are free of sediment and among the clearest in the world. Tippy’s famous beachside restaurant is a mile away (you can walk the beach to get there). Other upscale restaurants within easy driving distance include Cocodimama and Pascal's at Sky Beach Club. The town of Governors Harbour, a mile away, has a charming collection of 19th century homes and churches overlooking its historic harbor. The recently restored Haynes Library, which dates from 1897, hosts a weekly coffee hour for foreign residents and tourists. The base rate for The Boat House is for the upstairs one bedroom apartment for two guests. There is an additional charge of $30/night for each additional guest in excess of 2. If you have 3 or 4 guests total, one of the downstairs bedrooms (your choice) will be included in the rental. If you have 5 or more guests total, both downstairs bedrooms will be included in the rental. The Boat House is rented to ONLY ONE group at time. Unused bedrooms are simply locked off. My guests and I had a wonderful stay at Boat House in March 2019. Eleuthera is my absolute favorite place in the world and this stretch along Banks Road is at the top of my list in terms of places to stay on the island. The location is wonderful with proximity to town and my go-to places (Tippy's, Bacchus, Da Perk, Buccaneer Club, 1648) and a short jaunt down to Eleuthera Island Farms. The home, while a bit quirky in its layout, really has everything you need. Hot water, clean and well maintained, functioning AC in all rooms and a simple Bahamian aesthetic that makes you feel right at home. When I arrived, the home was spotless and smelled fresh and clean. The kitchen, bathrooms, floors and living area had been cleaned to sparkling perfection. I appreciated the extra beverage fridge since we cooked most of our meals and preferred to make drinks at home. We watched beautiful sunrises on the beach, just across the street and sunset cocktails from the balcony. My only, very small note would be that because the house is situated so close to the road and a few of the windows did not close entirely, it can be quite noisy as cars drive by. It took me a few nights to get used to it but I was still able to sleep soundly. Also, the kitchen could use a few more pieces of cookware (larger variety pots and pans) although we were able to make everything we needed with what was provided. The inclusion of a blender would be nice as well, but again- a small preference as I do enjoy a morning smoothie and and evening pina colada ;) Edgar was great and accommodating. My flight out of Nassau had been delayed several times, putting me about 5 hours behind schedule but he made sure to have the house ready and keys available, despite my late night arrival. We enjoyed the best of the island during our stay-- the central location made it a breeze. The best of Governor's Harbour is within a 5 minute drive of Boat House. Nice location & caretaker very responsive, but the following items were beyond his ability to repair or replace. A number of problems with amenities including: Half of the windows inoperable;Kitchen utensils in poor condition and/or lacking (no pans provided, dull knifes, few appliances); Shower door constantly off track; TV signal not work 5 out of 7 days; Rusty Beach chairs, torn umbrella; Outside Grill old rusty, inoperable; Couches pillows moldy. The owner is replacing the worn or missing items. The windows are a longer term project. We will report news on that when it is available. The rental property was comfortable and clean! This was a great place to relax at the end of a long day out. Edgar was waiting for us when we arrived, and was easy to contact throughout our stay. We would be happy to stay here again and recommend this house to family and friends. Hi folks, All good at the boathouse with excellent location. Just need to work on the shower which is falling apart. An outdoor shower would be ideal. The outside furniture could be arranged a little better upon arrival for a better welcome. Overall quite good. We had a wonderful stay at The Boathouse! There were no disappointments - it was exactly as described in the ad and more. I slept soundly every night listening to the soothing Atlantic waves. We didn't need to use the AC as the gentle breezes kept us cool and comfortable. The beach access was close and the beach itself was pristine, very quiet and the water was warm and inviting! We were close enough that we walked from town after a morning of sight seeing and souvenir shopping. A rental car is a must to see the rest of the island, which we toured from north to south (one week is not enough)! The residents of Eleuthera were very, very friendly and helpful. I'm definitely planning to return next year. It was my first introduction to the Bahamas and it exceeded my expectations. Perfect value for money! Stunning beach! It’s a small, but perfect house. Though it doesn’t look very fancy from the outside, inside it’s just exceptional, very clean and well-maintained, stylishly furnished, has everything you need during the vacation: tons of spare towels and bed linen, kitchenware, lots of well-organized storage space, combined washing machine & dryer, beach chairs & umbrella. The bunk room perfectly accommodates all the kids in one place. The absolutely stunning long pink-sand beach is just across the road, literally 2 min walk. The road is safe, with almost no traffic and speedy cars. The close reef slows down the big waves, so again no problems for the kids in the water. Two good restaurants are very close, one – The beach house is a 3 min walk, second – the famous Tippy’s is a short ride or a 10-15 min walk, make sure to reserve a table. You would definitely need a car to enjoy the island to the fullest. Again the house is perfectly located right in the middle of the island. The manager – JJ is absolutely friendly and ready to help in any situation, even when it’s not about the house. By and large it's a good and enjoyable property. This house is located just 200 feet (60 meters) from the beach, as you can see on the satellite map. Rates are for the first 2 guests (first 8 guests for the Christmas and New Years holidays). For each additional guest add $210 per week. Note: We set the rates this way to make the house more affordable for small groups who use less utilities and create less wear and tear.